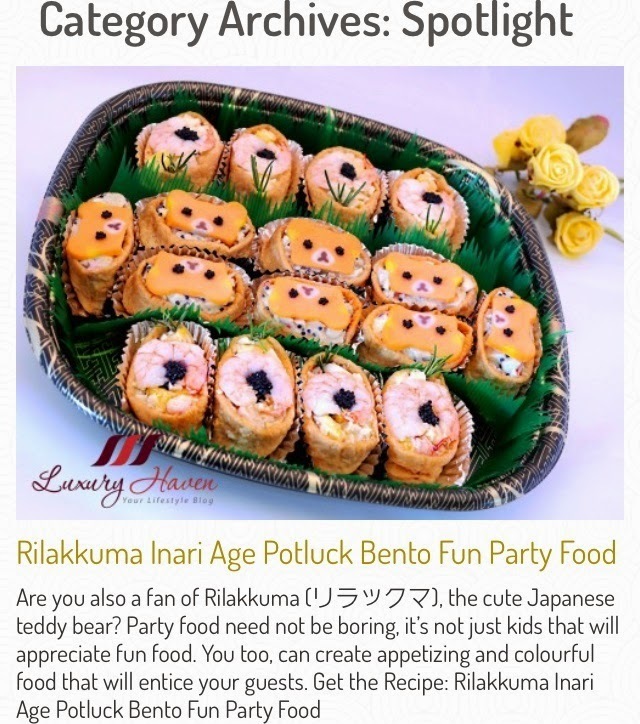 Are you also a fan of Rilakkuma (リラックマ), the cute Japanese teddy bear? Do you know that Rilakkuma ranked as the fifth most popular character in Japan? I had a potluck party recently, another gathering with my childhood friends. I'm always looking forward to meeting this group of friends as we've shared many wonderful childhood memories together. 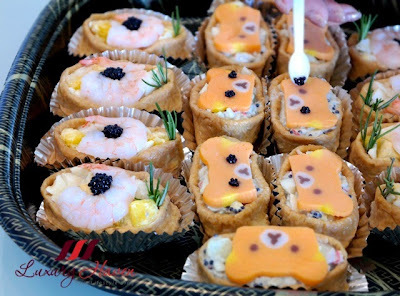 Party food need not be boring, it's not just kids that will appreciate fun food. 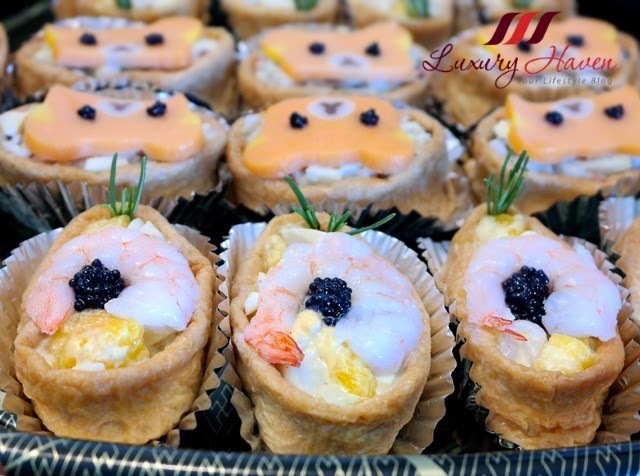 You too, can create appetizing and colourful food that will entice your guests. 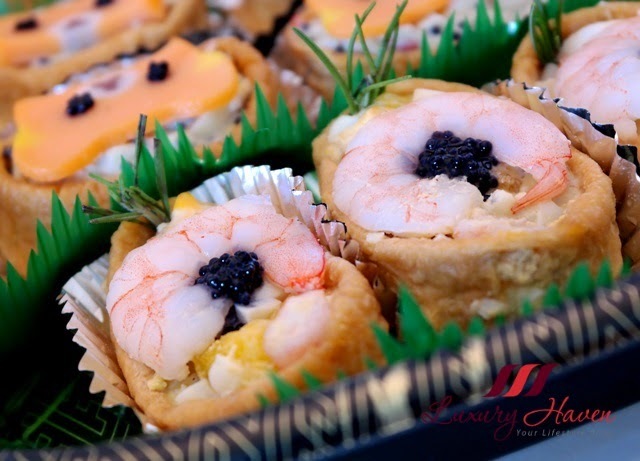 To add some glitz to my Inari Sushi ( 稲荷寿司 / いなり寿司 ) Bento tray, I also had Caviar added to my appetizers. Look at how the eyes of Rilakkuma sparkle with joy! Well, a few good places in Singapore to order the black gems would be Delicia, Culina, or the Gourmet Shop. To inject some varieties, I prepared two types of appetizers; one using apples and crabsticks, and the other with prawns and mangoes to cater to the different palates. Don't you think the party tray is rather aesthetically appealing to the eyes? Does this party tray stimulate your appetite? Peel and dice eggs. Mix with salad cream and pepper. Mix well, and divide equally into two containers. 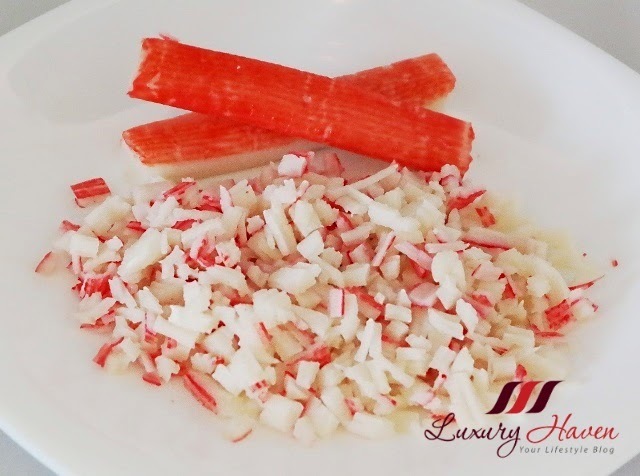 Blanch crabstick in boiling water. Drain and chop them up. Rinse and remove apple skin. 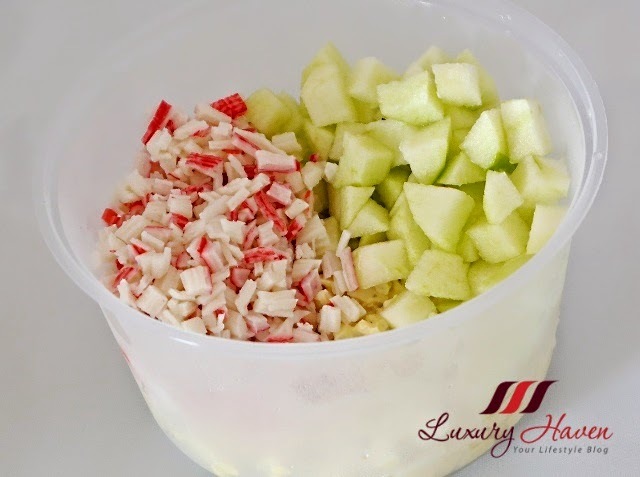 Cut into cubes and put them in salt water to prevent browning. 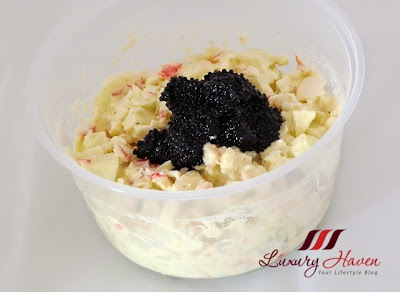 Add apples and crabstick to egg mayo and mix well. Stir in caviar gently into egg mayo mixture. 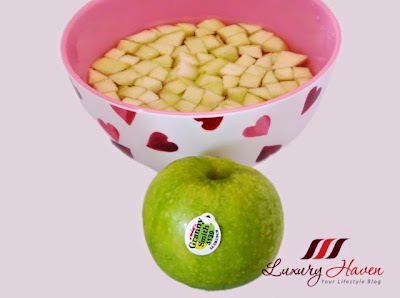 Squeeze out excess juices from Inari Age, and fill 8 pockets with the apple crabmeat mixture. 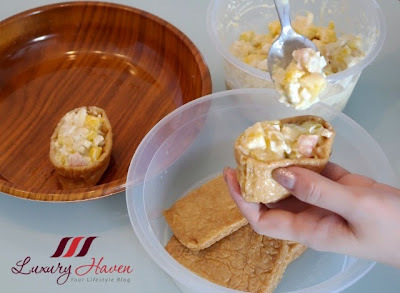 You can fold in the beancurd skin if you like. Slice the rilakkuma fishcakes and place them on top of the inari age. 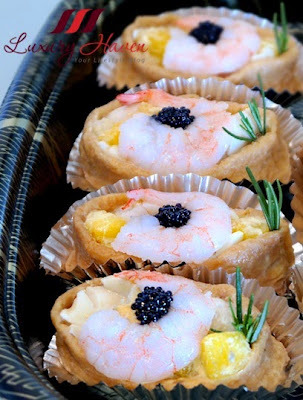 Shell and devein prawns. 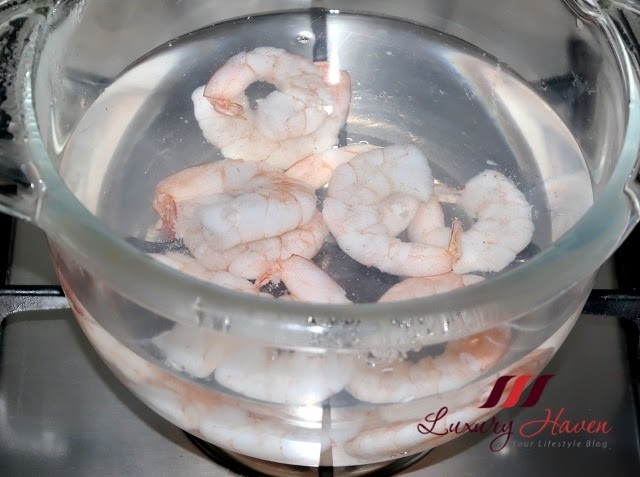 Rinse and blanch in boiling water. Drain and transfer to ice water to stop the cooking process, and to keep the prawns succulent. Butterfly 4 prawns and set aside for presentation. Dispose mango skin, rinse and dice. Mix well with the rest of the prawns and egg mayo. 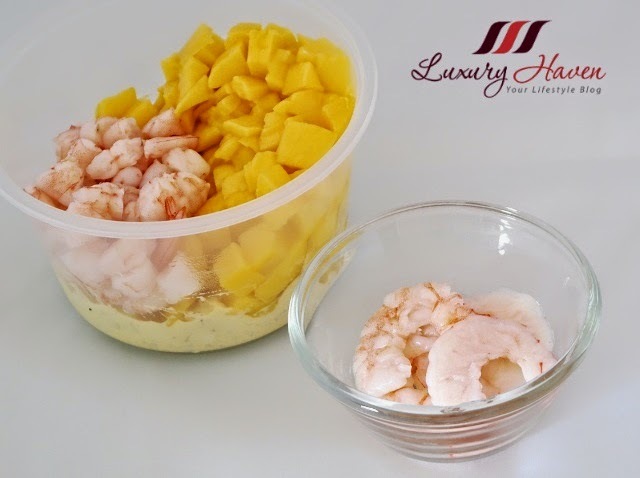 Fill the other 8 pockets of the inari age with the mango prawns mixture. Put the appetizers into a nice Japanese bento tray. Top them each with half the prawns and then caviar. Add rosemary for aroma and presentation. 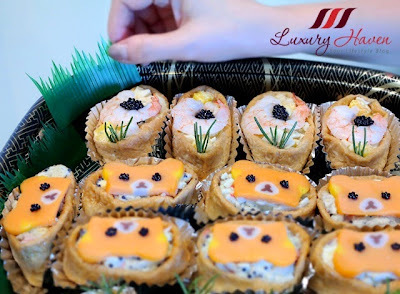 Transfer the Rilakkuma Inari Age Sushi to the party tray, and add caviar to the eyes. Add them last as the caviar may move due to the smooth surface of the fish cakes. 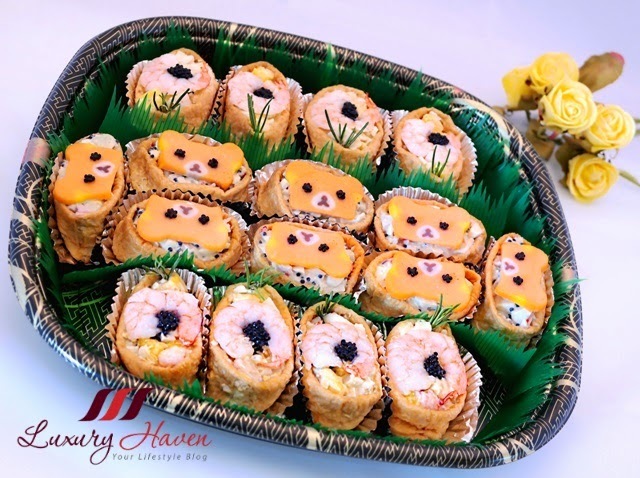 Decorate the tray with Baran Sushi Grass Dividers. Cover and refrigerate until you're ready to serve. If you're bringing it to a party, make sure you put it in a cooler bag with ice packs if possible. Be ready to impress your guests with this Kawaii Rilakkuma Inari Sushi Bento! My daughter is a great fan of Rilakkuma. She would be overjoy if I could make some of this for her. DS, I'm sure she'll love this! You are right. Party food can be happening and I now understand why. Nava, hahaha! This is fun, isn't it?? This looks impressive to serve and delicious to eat. Great job. Ghada, glad you like it too! Rinako, hahaha! Knew this would catch your attention! this look so amazing dear! Kenny, thanks & have a good week! 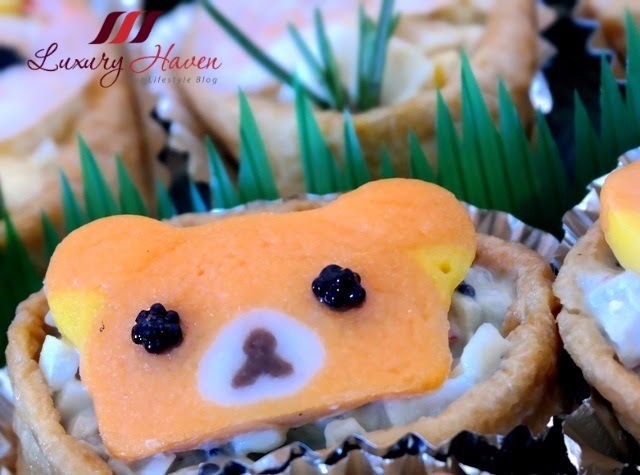 Shirley, to answer your questions: 1) I didn't know about Rilakkuma, but I can see why they're so popular -- extremely cute :) -- and your caviar "eyes" DO make them sparkle! 2) Aesthetically appealing? Appetite stimulating? (Okay, that was two questions in one.) Yes & yes. What a fun treat for your childhood pals! I'm also loving your appetizer fillings and the thought (and flavor!) you put into your parties. Kim, I'm delighted you can sense those eyes are talking to you. Hahaha! Thank you dear, you always put a smile to my face! 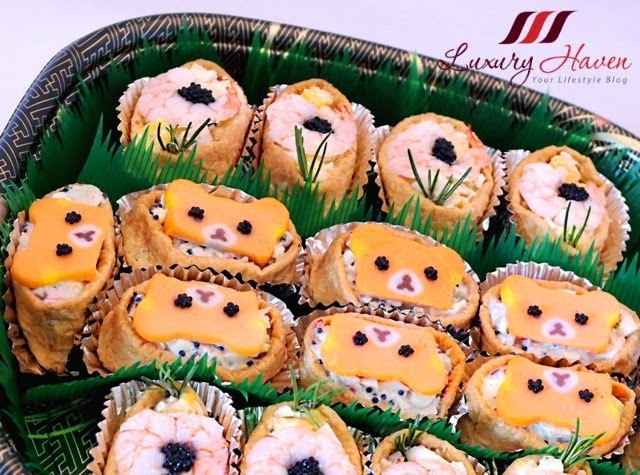 Wow, so nicely decorated Sushis, the kids must love them! SD, hahaha! All the kids inside us!! 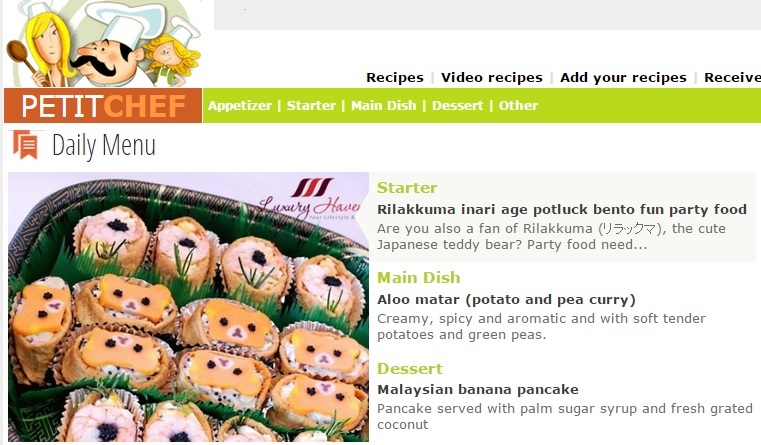 Arjunan, great this caught your attention too! Thanks for coming by! eeee...these are just so cute !!! Kathy, hahaha! Make for your boy lah!! 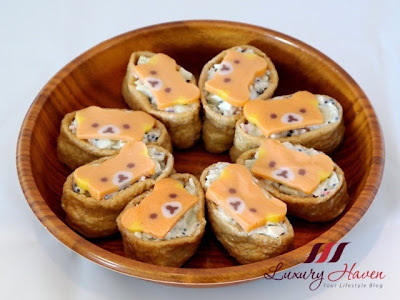 Lina, try making them for your kids! Shirley, I want one whole tray to myself LOL! PH, please help yourself! Hahaha! Andrea, you just look while we eat. Heehee! EFS, you should try these if you do get the chance. Real yummy, dear! Rajiv, thanks & have a lovely weekend! Gabusiek, thanks for following & I'm also following you now! It is too beautiful to be eaten, Shirley! Rose, I'll just let you eat one! Heehee! too cute to eat la. Candy, you watch us eat then! Heehee! I love bento and this looks fabulous! Your recipe seems very doable, I do have some cooked crab meat and shrimp in the fridge and also mangoes. Bal, it's very simple so you'll have no problem handling it at all. Have fun bento-ing! Subha, thank you & have a good weekend! I'm not a fan of Rilakkuma but I'm big fan of Inari. Inari is always what I ordered when i went Japanese restaurant and even when i was in Japan, I can't help myself but eating inari almost every single day. 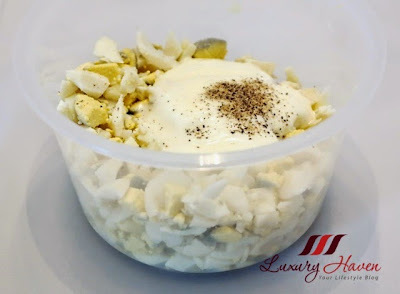 This looks kinda simple to make and thanks for sharing this recipe. Can't wait to try out to make it someday. 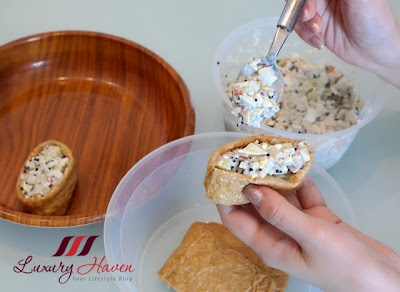 You could always make them for Hospice Patients to enjoy. We are trying to bake birthday cakes for them regularly now. Wife bakes and I pump icing decorations. Tan, hahaha! No lah, I just love playing with food. Wow, that's a nice teamwork that you guys have! Bet you're enjoying a meaningful life!